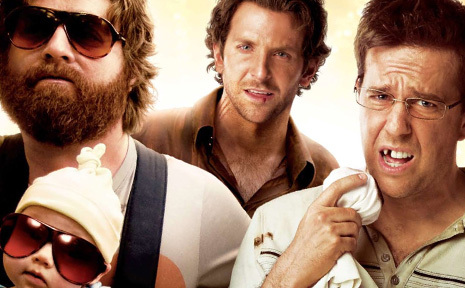 ENTER our competition for your chance to win a double pass to see The Hangover. Two days before his wedding, Doug (Justin Bartha) drives to Las Vegas with his best buddies Phil and Stu (Bradley Cooper and Ed Helms) and his future brother-in-law Alan (Zach GalifIanakis), for a blow-out bachelor party they vow they’ll never forget. But when the three groomsmen wake up the next morning with pounding headaches, they can’t remember a thing. Their luxury hotel suite is beyond trashed and the groom is nowhere to be found. But the more they begin to uncover, the more they realise just how much trouble they’re really in. It’s a weekend, they will never forget, they just have to remember it first! For your chance to win a double pass to see The Hangover, only at the movies from June 11, simply tell us in 50 words or less about the craziest thing you’ve ever done and lived to tell the tale. Check out what else is on at the movies or view session times in our comprehensive movie guide.